Bjorn came back from Trinity this afternoon. He will be here for about a week. 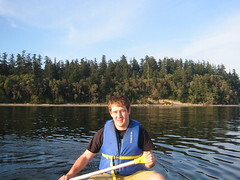 He and I went on an evening canoe ride over to Blake Island. The weather was great and the water was calm. It was a great evening for a paddle on the Sound. Bjorn is anxious to use my sailboat, so I am going to have to have to put boat prep in high gear. He may need to help me sand and paint! It is good to have him home and we wish that he could stay the summer, but he is going to work up in Whatcom county again.